yellow and white light. 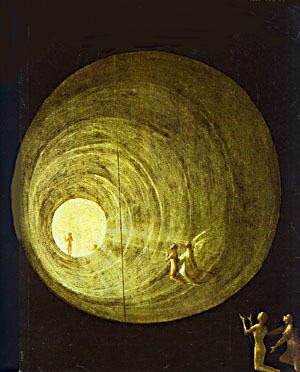 Bosch recorded in infinite detail the horrors of Hell, but also rendered the simple, singular image of a soul's passage into a tunnel of blinding white light. This leads us to images of the Sacred as they appear in Visionary art. Strangely, it has been forgotten that, for the greater part of its history, Art has concerned itself with the making of 'holy objects' - objects that bring the Sacred before us, before our eyes and into our hearts. This is true not only of painting (Gothic alterpieces, Byzantine icons), or even of Western culture as a whole (cathedrals and monasteries), but of all cultures in all times. Whether it be art produced by Tlingit natives, Michelangelo, or prisoners in concentration camps, a sacred quality unerringly inheres. And this leads us to wonder - has not the history of art, particularly the history of Western art, been a gradual wandering down the wrong path for more than two or three centuries? The intensive questioning of Modernism, the ironic stance of Post-Modernism, the avoidance of images, frameworks, even of art itself in contemporary art - are not these symptoms indicative of deep cultural illness? And yet, it would perhaps be better to diagnose our affliction as a deep spiritual illness. Christianity has offered our culture nothing but a prolonged awaiting: the Hebrew prophecies expecting their Messiah; the Messiah's own proclamation of his death, resurrection and expected return in the Apocalypse. In order to escape this burdening anxiety and anticipation, generations of artists have sought solace (or distraction) with color, form, abstraction, simplicity, concept, environment, happening, and so on. But this is mere evasion. They have evaded the task borne by artists since shamanistic times: to interiorize, visualize, and mythologize.